It has long since been believed by many, and widely researched, that imagination is vital to successful learning in children. Children learn best when they are engaged in their learning and when there are engaging their imaginations. Capitalising on innate imagination and fostering it goes a long way to assisting this and thus improving pupils learning outcomes. Pupils with good imaginations can advance their all-round cognitive development and progress in all areas of the curriculum. With writing especially, children with strong imaginations are more likely to become confident, independent writers. Consequently, imagination is an essential part of the learning process. Imagination can help give learning a more meaningful platform for pupils. Providing children with contexts, themes or ideas that matter to them increases their motivation to learn through giving them ownership over their own learning journeys. Learning that is built over time and in collaboration with the pupils is more effective, develops independence skills and positive learning attitudes as well as ensuring that learning is remembered and embedded. Simply ‘delivering’ learning to children is not the most effective way to ensure progress. Creativity and problem solving are essential everyday life skills that we need to be ensuring we develop in our pupils. Being able to generate innovative ideas involves an imagination that helps pupils see beyond the norm, beyond reality. Pupils who have a limited imagination will struggle with these areas of life and with many aspects of the school curriculum. Imaginative play and drama based activities enable children to explore the world around them and the people in it. Imagination also develops neurological connections in pupils brain from moving around and using their senses and muscles. Delving into imaginative worlds based on the experiences that they see around them helps young pupils to make sense of their reality and learn how to communicate with others. Read more about the importance of imaginative play for child development in this article in Psychology Today. Reading books and hearing stories facilitates pupil’s imaginary games through capturing pupil’s imagination via the adventures, characters and illustrations. Frequent reading obviously sets the foundation of reading and learning skills for pupils. Through storytelling we can enable pupils to develop their vocabulary and communication skills not to mention their understanding and empathy. In turn, as your pupils move through their school career, this imagination and continuation of an interest in reading will widen their ability to participate in and be interested in all subjects of the curriculum. Paper cutting, origami, sewing, drawing, modelling, DT, art, dance, drama – just about every aspect of a creative curriculum engages children in using their imagination as well as improving fine motor skills and concentration. Older children benefit immensely from continuing to engage in arts based learning. Whatever their age, escaping into other realities and away from everyday life can be a vital part of their maintaining mental health and well-being. 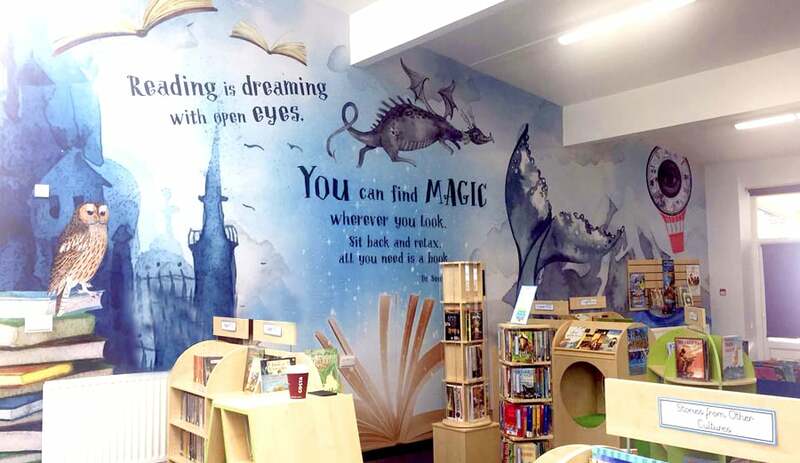 Whether though picture books, painting’s, wall art or other forms of art -colourful pictures inspire teachers and children alike to create their own stories and prompt them to delve into a world of imagination. Images are a form of visual storytelling that you can build a story around and fill in the gaps with your pupils. 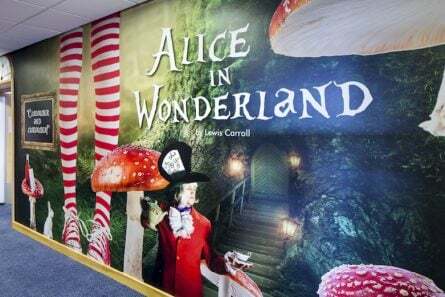 A wall of images can transport pupils into a fantasy world, often previously unimaginable for them, that inspires and motivates them to learn, teaches them something new or inspires their future pathways. Here at Promote Your School we are kids at heart and love nothing more than letting our imagination run wild with school’s walls. 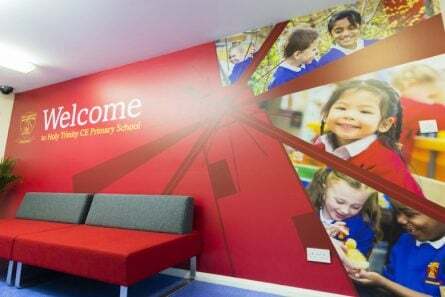 We love what we do and are committed to helping you foster your pupil’s imaginations through art on your walls. 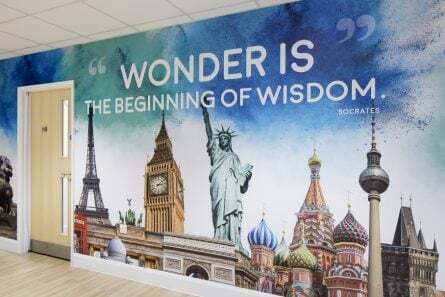 Take a look at some of the imaginative walls we have helped schools to create to do just this in our case studies section, or contact us today to find out what we can do to help you bring your pupil’s imaginations alive on 020 7404 3400 or leave us a message and we will get back to you.